At the height of the financial crisis in 2008, former North Carolina Congressman Brad Miller found himself searching for answers on Wikipedia. He was looking up “credit default swaps,” which the website defines as “a financial swap agreement that the seller…will compensate the buyer (usually the creditor of the reference loan) in the event of a loan default (by the debtor) or other credit event.” Largely unregulated, those swaps and other complex derivatives both amplified and obscured the risks of all the bad loans that mortgage companies had made and sold—and they bankrupted AIG. Miller was a member of the Financial Services Committee and a critic of the mortgage lending industry, but even he had no idea what they were. “After I finished reading the Wikipedia entry on credit default swaps, I probably knew more about them than any other member of Congress,” Miller told me recently, on the fifth anniversary of the Dodd-Frank financial-reform law. Cleaning up the derivatives market was one of the main pillars of that landmark legislation. On that front, and in many other respects, the law’s legacy is still a work in progress, hampered by repeated attempts by Wall Street and its allies in Congress to undermine implementation, and by foot-dragging in some regulatory agencies. But the law did offer substantive reforms, and Miller’s fingerprints are on many of them. He proposed in committee the creation of the independent agency that became the Consumer Financial Protection Bureau, and shepherded it through the House; worked with then–FDIC chair Sheila Bair to toughen the “living will” provision of Dodd-Frank, which requires banks to create plans for their own dissolution; and introduced an amendment to restrict the risky, speculative trading undertaken by banks, a limit now known as the Volcker Rule. Miller continued to push for reforms to the financial system and strong consumer protections beyond the bounds of Dodd-Frank until he left Congress in 2013. 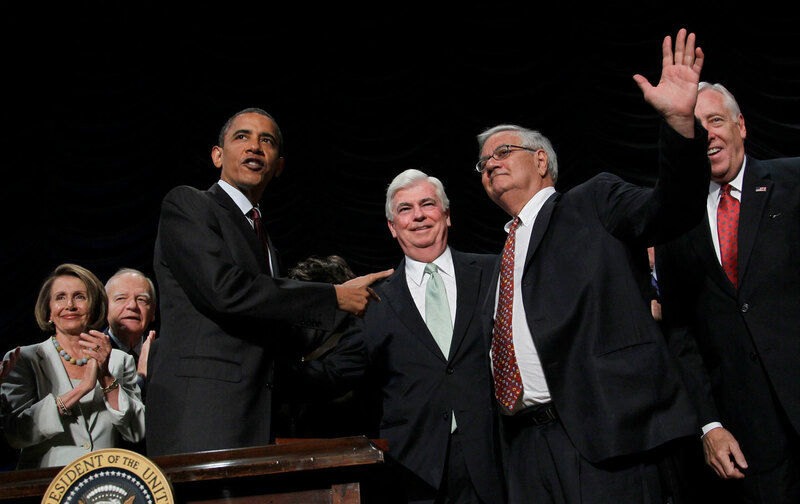 With the five-year anniversary in mind, I spoke with Miller about Dodd-Frank’s legacy, Congress’s ability to oversee the financial industry going forward, and accountability for criminal actors. The conversation has been edited for length and clarity. Zoë Carpenter: Five years out from the passage of Dodd-Frank, what pieces of financial reform are going well, and what’s not? Brad Miller: Dodd-Frank was a compromise, and obviously reformers didn’t get everything we wanted by any means. But things are better on a lot of fronts, and still very fragile and there are a lot of problems on other fronts. In consumer finance, the creation of the Consumer Finance Protection Bureau was an enormous advance. The mortgage rules, although the were not perfect, are certainly going to protect against the most outrageous abuses, the predation of the last decade which led to the foreclosure crisis and really the sharp drop in the life savings of American families. The median American family suffered a 40 percent loss of net worth, of life savings, in five years following the financial crisis, almost entirely because of the foreclosure crisis. For the African-American and Latino middle class, it has almost been an extinction event. The loss to the African-American and Latino communities were much worse because they were so targeted by predatory mortgage lending practices. There are other lending practices that are much better. The CFBP has done good work. They don’t have all the powers I would have wanted them to have, but they’re certainly chipping away at some of the worst abuses. Making consumer complaints available will be a big help in spotting predatory practices, and to create pressure to address certain of those practices. That will be an important safeguard to keep the agency from being captured by business and industry interests in the future. "There’s just a lot of gamesmanship that does not seem to be doing anything useful for the economy." It is still very difficult for lower-income folks to get basic financial services under reasonable terms. Most people in the middle class, even they aren’t treated that badly or even if they aren’t having the catastrophic loss of their home to foreclosure because of a predatory mortgage, are still getting nickel-and-dimed by a lot of financial practices. That adds up. It ends up being a significant shift from a great majority of Americans as consumers to a very small investor class who benefit from the profits from unjust, predatory practices. In terms of the stability of the system as a whole, the act and other efforts have created demands for requirements for greater capital. The living wills in the early going were laughable, but the regulators are now making more serious efforts. But there is still a largely unregulated shadow bank system that is very much susceptible to runs, which is what happened to Lehman Brothers, really. It may create great instability in the financial system at some point in the future if there is another run in the shadow bank system. There’s also just a great deal of entirely unproductive conduct—of gaming markets, of a bloated financial system that is taking up far too much of the total economy. The story of Goldman Sachs and the aluminum warehouses—the litigation over that has really suggested that the motive for doing it was to take advantage of positions that Goldman Sachs was taking in aluminum futures. They were betting for aluminum prices to go up or down, and they were in a position to control whether prices went up or down. The same is true in a lot of other markets: there are wild swings in commodity prices that appear to have nothing to do with supply and demand, and that means that the market is being distorted in some way. There’s just a lot of gamesmanship that does not seem to be doing anything useful for the economy and it’s taking too much from it. It’s still a financial system that needs reform. The economy is not going to work right—it’s not going to grow and produce a broadly shared [prosperity]—as long as we have a financial system that uses companies that actually do something useful just as chips in casino banking. In light of that gamesmanship, should the Justice Department have been more aggressive about prosecuting? "There simply has not been enforcement of the rules, which we need to impress upon folks in the financial sector that we’re serious." Yes, yes. In the immediate aftermath of the financial crisis there were folks who were saying that they wanted to see perp walks, they wanted to see criminal prosecutions. My immediate response was that we don’t do things that way. We don’t bring about criminal prosecutions just because there’s a mob demand for heads on pikes. But now we have seen all kinds of evidence of pervasive criminal conduct throughout the financial sector that has simply not been prosecuted. To the extent it has been prosecuted there’s been an agreement to hold the prosecution in abeyance as long as they promise not to do it again. There simply has not been enforcement of the rules, including enforcement of the criminal laws, which we need to impress upon folks in the financial sector that we’re serious. It’s offended the sense of justice of the American people, and of my own sense of justice, that you’ve got the examples we’ve had in the black community of inequities in the criminal-justice system at the same time that you’ve had folks committing very serious crimes in the financial sector and nothing happens to them. HSBC admitted to money laundering—flagrant money laundering—for the Colombian and Mexican drug cartels, for genocidal regimes, for Sudan, for terrorist organizations, for nations that were state sponsors of terrorism, and they got penalized about three months of profits. The top executives at HSBC might feel a bit chagrined at Christmas parties, but that seems like a very mild punishment compared to what happens to others when they violate the law. Since we already have problems enforcing criminal law, do you have doubts that the provisions of Dodd-Frank, including those that have yet to be implemented, will be enforced? Enforcement is always going to be an issue. That’s one of the reasons why the CFPB’s independence is very important. The dependence of other regulatory agencies with important enforcement powers on annual appropriations from Congress means that those industries can use their political clout, which is considerable, to cut back the funding those agencies have to enforce the law. That’s certainly been a problem for the [Securities and Exchange Commission], it’s certainly been a problem for the [Commodity Futures Trading Commission], it was a huge problem for the old [Office of Federal Housing Enterprise Oversight]. You’ve said before that one of the things that kept Congress from foreseeing or preventing the financial crisis was that it was getting all of its information directly from the financial sector. Do you think Congress is better prepared now to prevent another crisis? I do think they are. Matt Taibbi wrote a piece in which he mentioned a Democrat on the Financial Services Committee who said that during the financial crisis he had to look up “credit default swaps” on Wikipedia. That was me [laughs]. And after I finished reading the Wikipedia entry on credit default swaps I probably knew more about them than any other member of Congress. The industry controlled the agenda, and controlled what Congress looked at. I think there are now other sources of information, and some scholars and experts in academic settings who are now connected with policymakers. Americans for Financial Reform continues to be a helpful and influential organization that pulls together a lot of the natural allies. And there are think tanks that do work on these issues and stay connected to the policymakers. That is an improvement—there are other sources of information for the members of Congress who want other sources of information. Have we ended “too big to fail”? It depends on what you mean by “too big to fail.” There obviously are financial institutions that, if they failed, would still collapse in a heap because they’re just one big sloppy mess of an enterprise, and every subsidiary and holding company would also collapse at the same time, and it would have enormous consequences throughout the financial system and throughout the economy. What has been called the “subsidy” for “too big to fail,” the lower interest rates that they get because of the assumption by lenders that those firms are too big to fail even if their actual financial status is incomprehensible—the living wills are beginning to get at that. Those are becoming more serious. But I do think that the biggest banks should be smaller and less complex. I introduced legislation that Sherrod Brown and Ted Kaufman introduced in the Senate to put a cap on the size of banks; it would have required the six biggest banks to be broken up into at least 30 different banks. And of course Elizabeth Warren and others have introduced a new version of Glass-Steagall which separated investment and commercial banking. That approach would make banks less complex, which would also have the effect of making them smaller. I think we would be better off if financial institutions were smaller and less complex. Have Democrats shifted in their willingness to take on the financial industry? For example, what do you make of Hillary Clinton’s tough talk about Wall Street but then the statement that she wouldn’t reinstate Glass-Steagall? She herself hasn’t said that. Alan Blinder, who is one of her close economic advisers and a serious economist, said that she would not support that. Bernie Sanders and Martin O’Malley both do. There are still ways to keep bank holding companies from collapsing in one big heap other than breaking them up, though I favor breaking them up. If you required stand-alone bankruptcy remote entities, to use the jargon—separately capitalized, separately managed subsidiaries that might be wholly owned by the bank holding company but still are separate, which was the idea behind the swaps push-out, which has been repealed—if you had enough of those that might make a difference as well. Is there anything else in particular that you would you like to see happen in the next five years with financial reform? The issue I worked on most at the time was consumer protection, and there has been some progress on that. But it has been very hard for a great many Americans to get basic financial services on reasonable terms. Something like postal banking could make an enormous difference. Or another proposal that could probably be required by the CFPB is making bank accounts as portable as cellphone accounts. In the 1990s there were a lot of complaints from consumers that they were getting gouged by their cellphone companies, and it was a terrible nuisance to change because they had to change their numbers. The FCC required that cellphone accounts be fully portable, and that introduced huge competition in cellphone services. [Laughs]. As annoying as your cellphone carrier is now, it was actually worse 15 years ago, if you can even imagine that. If bank accounts were as portable as cellphones, if they irritated you, if they nickel-and-dimed you enough that you just wanted to change banks, it would be easy to do. That would create a great disincentive to nickel-and-dime consumers, and it would create forces of competition that would protect consumers probably better than a long list of rules would.